Matt Torigian was appointed Ontario’s Deputy Minister of Community Safety, effective June 9, 2014. 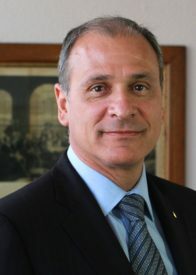 His portfolio includes the Ontario Provincial Police; public safety including police education and training, the monitoring and inspections of police services and boards; the provincial security advisor; criminal intelligence services of Ontario; the death investigations system; and the Office of the Fire Marshal and Emergency Management. Additionally, he was briefly responsible for overseeing Ontario’s correctional system. With a dedicated team of executives, Deputy Minister Torigian is leading a comprehensive transformation to ensure that all Ontarians are supported and protected by accountable, efficient, and effective justice and public safety systems. This work led to the passage of Bill 175, the Safer Ontario Act, built upon a risk-based, multi-sectoral and collaborative approach to community safety and well-being. Success will rely upon a robust system of data integration along with accompanying research and evidence-based policy development. Prior to his appointment to the Ontario Public Service, Matt served with the Waterloo Regional Police Service and was appointed Waterloo Region’s fifth Chief of Police on December 12, 2007. Matt is a Past President of the Ontario Association of Chiefs of Police, and served as a member of the Board of Directors with the Canadian Association of Chiefs of Police. Matt is a graduate of Wilfrid Laurier University and holds a Masters Degree from the University of Western Ontario. Matt is also a graduate of the FBI National Academy, and was invested as an Officer of the Order of Merit of Police Forces in 2012.